The latest Sample Registration System (SRS) data, released by the Census of India, have gone a long way to suggest that housing, especially for the poor, remains one of the most neglected sectors in “vibrant” Gujarat. 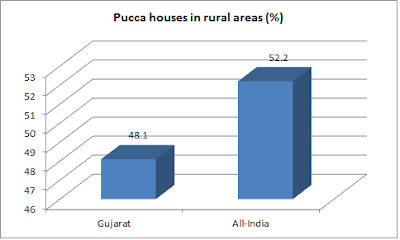 With just about 48.1 per cent pucca houses in Gujarat, the data reveal that this is well below the national average of 52.2 per cent. While as many as 13 out of 21 major states having a higher proportion of pucca houses in rural areas, the data show that Punjab and Haryana top the list with 92.8 per cent and 91.8 per cent respectively. Only so-called Bimaru states – Bihar (31.9 per cent), Chhattisgarh (18.9 per cent), Jharkhand (23.2 per cent), Madhya Pradesh (26.1 per cent), Odisha (30.2 per cent) and West Bengal (28.5 per cent) – have lower proportion of pucca houses in rural areas than in Gujarat. About 29.8 per cent of the houses in the rural areas of Gujarat are semi-pucca, and another 22.4 per cent are kutcha, the SRS report says. This is against the all-India average of 19.8 per cent and 28 per cent, respectively. What should be equally worrisome to Gujarat’s policy makers is, a whopping 39.9 per cent of Gujarat’s houses are one room, which is against the national average of 33.1 per cent. Only four states have a higher proportion of one room houses – Bihar 44.3 per cent, 41.9 per cent, Tamil Nadu 47 per cent, and West Bengal 42.7 per cent. Kerala has just 3.5 per cent of one room rural houses, but it has the largest proportion of big houses in India. As against Gujarat’s just 1.2 per cent of houses having five plus rooms, Kerala has some 12.6 per cent such houses. The all-India average on this score is 3.4 per cent. 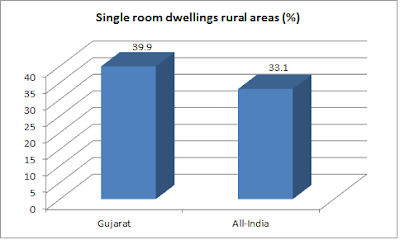 Majority of Gujarat’s rural population appears to be living in two room dwellings – they form 45.1 per cent of the total dwelling units in the rural areas, as against the national average of 43.8 per cent. The SRS data, however, suggest that, in housing conditions, urban areas are somewhat better than the national average. 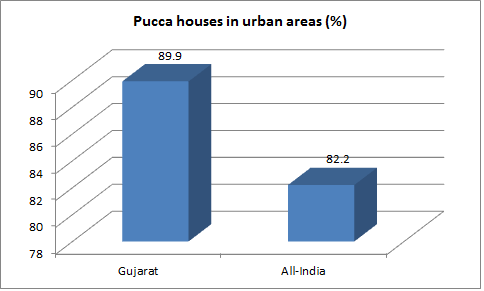 Thus, 89.9 per cent of houses in urban areas are pucca, as against the national average of 82.2 per cent. Here, too, the best performing states are Punjab and Haryana with 95.2 and 93.2 per cent of pucca dwellings. 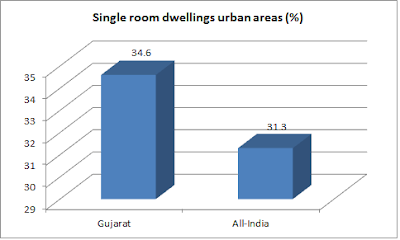 However, majority of Gujarat’s urban population lives either in one room or two room houses – 34.6 and 50.1 per cent respectively. This is against the national average of 31.3 and 40 per cent respectively. There are just two states, both of them more urban that Gujarat – Maharashtra (49.6 per cent) and Tamil Nadu (41.9 per cent) –that have a higher proportion of one-room dwellings. Gujarat’s just 11.2 per cent of dwellings have three rooms, 3.1 per cent four rooms, and just 1 per cent more than five rooms – as against the national average of 16, 17.4 and 5.1 per cent respectively.